What’s up My Fellas!!! I am back with yet another review. Today I bring Red hot chili peppers hub. 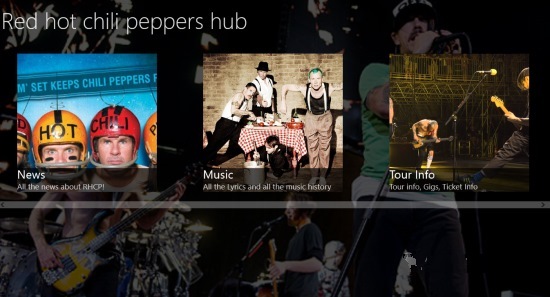 Red hot chili peppers hub is a Windows 8 Entertainment App for all the people around here who enjoy listening to Red Hot Chili Peppers. The app will provide you with the Latest News, Lyrics for all tracks of every album of Red hot chili peppers, and their tours information. This Windows 8 Entertainment app is freely available in the Social category of the Windows Store. Let’s get you a better idea about this free Windows 8 Entertainment App. As I said earlier, this app will turn out to be useful for you if you are interested in the news, updates, lyrics for any of the Red Hot Chili Peppers’s tracks. As you get to the main screen of this app after launching it, all the options that are available for you will appear in front of you categorized as News, Music and Tour Info. In this section of this Windows 8 Entertainment app, you will get all the latest news and happenings with Red hot Chili Peppers. News available in this category of this Windows 8 Entertainment app are rightly updated from the Red Hot Chili Peppers’s Official Website. All the news headlines along with their date, will appear in a panel on the left side. Whichever News you chose to see, will appear in the panel on the right side of this category page of this Windows 8 Entertainment app. 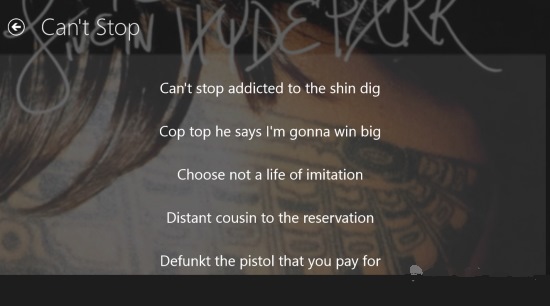 In this category of this Windows 8 Entertainment app, you will be able to view all the Red Hot Chili Peppers albums along with the lyrics for all the tracks of these tracks. Here, as you click this option, all the albums will be available as tiles. 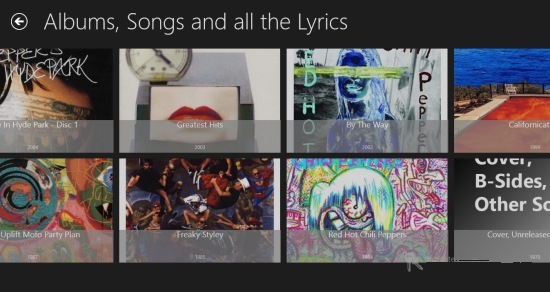 Now, as you get to any of the album, all the tracks for that album will be displayed to you. Click any of the track to read its lyrics. 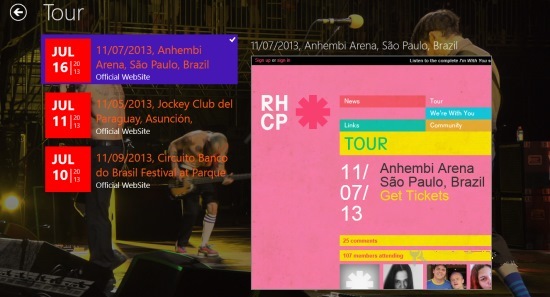 In the tour info category of this Windows 8 Entertainment app, you can get all the information about the tours on which the band is going to perform. Info like the tour place, its date, ticket info will be available here. This info is also updated directly from the official website. Free: The app is freely available in the Windows store. Keep updated about the latest news and tours of Red Hot Chili Peppers. Lyrics are available here, so that you don’t have to search for them online. In my view, the app is great for all those who love listening to Red Hot Chili Peppers. Try it and share your experience with us.